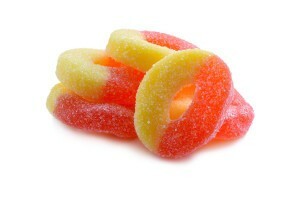 These gummy apple rings are refreshing and enticing to look at and a delight to eat. You get what you hope for when you pop one in your mouth. 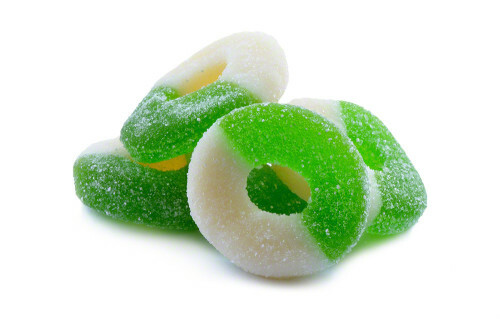 First, there's a wonderful sweetness from the glistening sugar that's sprinkled on each ring. Then, your taste buds quickly become aware of the exciting fruit flavor that intensifies as you chew. Corn Syrup, Sugar, Gelatin, Citric Acid, Sorbitol, Natural and Artificial Flavors, Lactic Acid, Titanium Dioxide, FD&C Yellow #5, Blue #1. 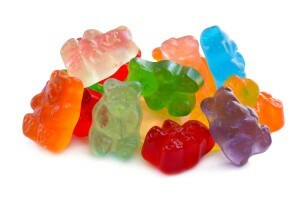 These are my son’s absolute favorite gummy candy and I can’t find them anywhere else. And the price is awesome!